It's difficult to know exactly how many women have PCOS, but it's thought to be very common and affect millions of women in the UK. You'll usually be diagnosed with PCOS if you have at least two of these features. 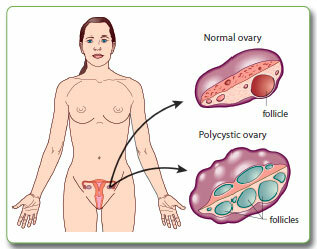 Polycystic ovaries contain a large number of harmless cysts up to 8mm in size. The cysts are under-developed sacs in which eggs develop. In PCOS, these sacs are often unable to release an egg, which means that ovulation doesn't take place. It's estimated that about one in every five women in the UK has polycystic ovaries, but more than half of these have no symptoms. The condition is associated with abnormal hormone levels in the body, including high levels of insulin. Insulin is a hormone that controls sugar levels in the body. Many women with PCOS are resistant to the action of insulin in their body and so produce higher levels of insulin to overcome this. This contributes to the increased production and activity of hormones such as testosterone. Being overweight increases the amount of insulin your body produces. If fertility medications are ineffective, a simple surgical procedure called laparoscopic ovarian drilling (LOD) may be recommended. This involves using heat or a laser to destroy the tissue in the ovaries that's producing androgens, such as testosterone. Options depend on which aspects of the condition are problematic and may require treatment. Treatment Options will be discussed with you in detail by Mr Swanton at your consultation. For further information please see the information leaflet.